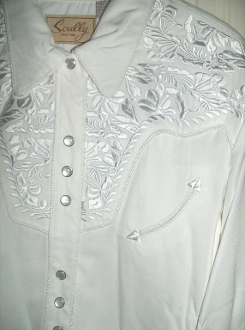 This Scully Men's Short Sleeve White Embroidered Western Shirt is a western favorite with the comfort of the short sleeves with beautiful vintage smiley pockets and retro floral embroidered yoke with pearl snaps. THE EXACT MEASUREMENTS IN INCHES ARE ALSO LISTED BELOW SO YOU CAN COMPARE WITH A WELL FITTING SHIRT OF YOUR OWN. Take a button down shirt, lay it flat, measure the side seams of the shirt, UNDER THE ARMPIT AREA. ONE SIDE ONLY, go from seam to seam, (Across from 1 side to the other) not all the way around.